Chem-Dry of Tampa FL uses an extremely effective pet odor eliminator to remove that familiar unwanted smell in your home. Pet odors are one of the biggest problems for pet owners . Pet can create odors in several ways. The biggest pet odor issue is pet urine deposits in carpet and furniture. Whether it's your carpet or upholstery pet urine damage is difficult to remedy. In Tampa FL there is a company that specializes in pet odor elimination, Chem-Dry of Tampa. Using their patented pet odor eliminator, called PURT, they effectively neutralize pet odors in your home. They can even eliminate pets odors on tile and concrete. PURT effectively removes 99.9% of pet urine odors and 99.2% of the bacteria associated urine deposits. There is no need to be held hostage by pet odors in your home. Feel free to invite people over again. Have a dinner party where the smell of your food will take center stage. 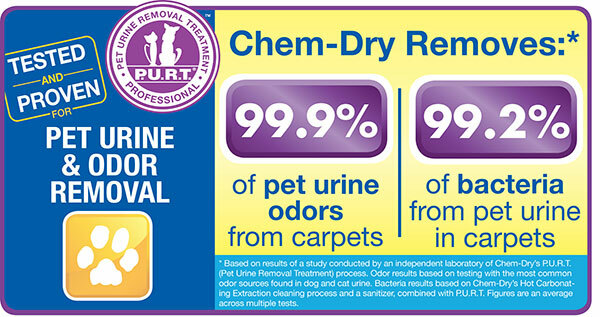 In Tampa FL Chem-Dry of Tampa is your pet odor eliminator.